We promise not to let it go to our heads TOO much, but yesterday we received a visit from a very distinguished customer: the Easter Bunny himself, out doing some market research. In between hops, bounces, and nose wriggles (that rabbit could seriously benefit from a cup of chamomile tea), he pointed out a few of his favorite goodies for Easter basket filling. Read on for his picks (he suggests throwing a few carrots in too, but that's your call). 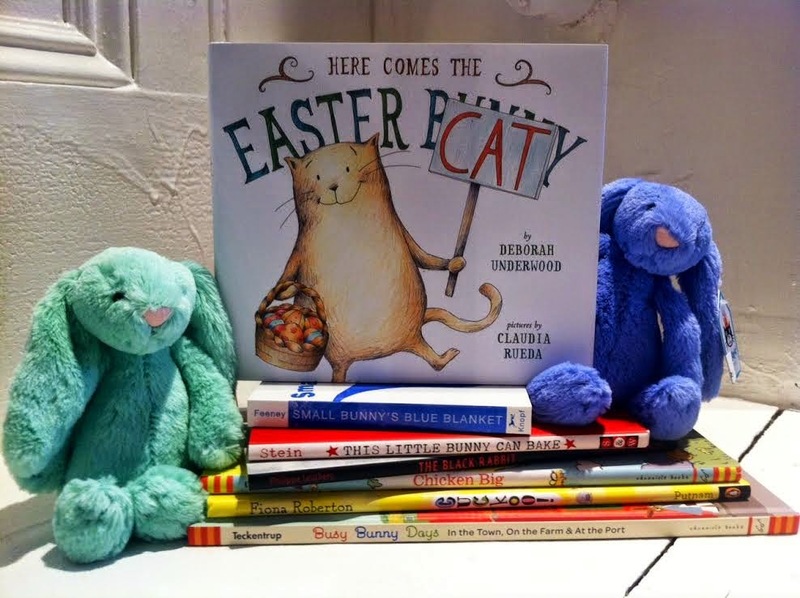 It's a Fiddlesticks tradition to celebrate holidays with a good stack of picture books, and the Easter Bunny thoroughly approved of our selection (probably because many of them star his aunts and uncles and many, many cousins). However, he laughed so hard at the idea of an Easter Cat that he sneezed six times in a row, which was quite a sight. It could happen, Bunny, you never know. No surprise that he was flattered by our homage to classic springtime sweetness: we've got tiny cloth bunnies with heart-shaped buttons for pacifiers, big mama bunnies with bows on their dresses, and decorated tin eggs hiding miniature yellow chicks inside, all from whimsical Danish toy line Maileg. 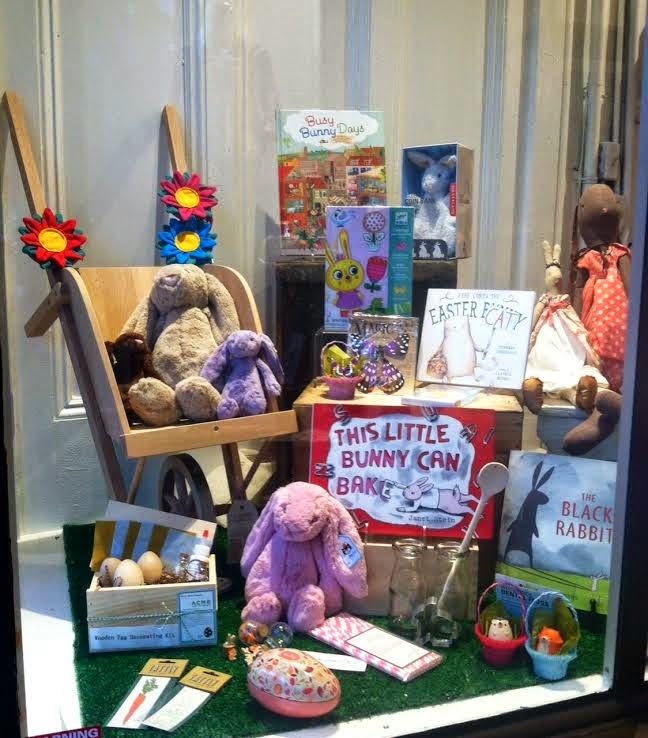 Our window displays drew the Easter Bunny in in the first place (he was on his way to buy a latte at Blue Bottle, which frankly we really don't think he needed...), and it's no surprise: they're stuffed to the brim with all kinds of Easter fun. 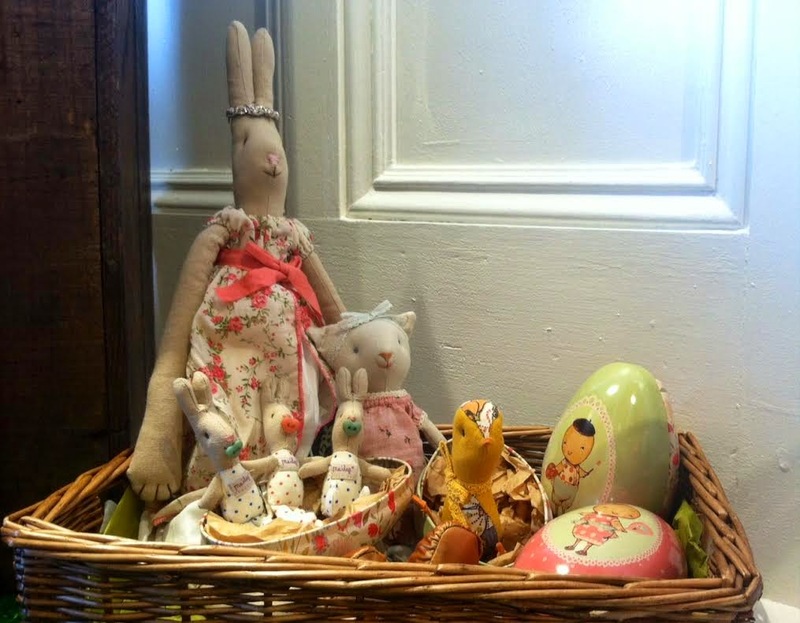 We've got kits for decorating Easter eggs, for sewing Easter sock puppets, for painting wooden bunny boxes, and for painting your face with springtime designs. We won't deny it: when it comes to stuffing Easter baskets full of chocolate and marshmallows, we're a bit Scroogish. (Are we mixing up our holidays? Anyway.) But we're so fully stocked with non-sugary treats that the Easter Bunny didn't even scold us for the lack of chocolate eggs. 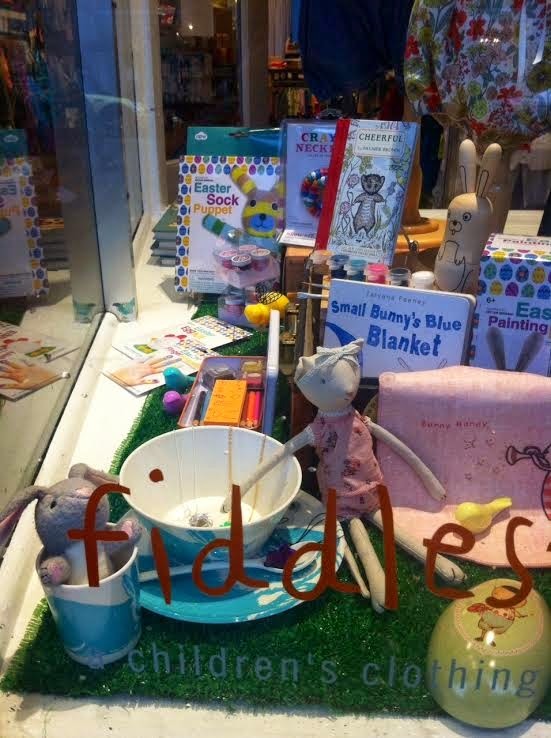 We have all kinds of trinkets and treasures for kiddos who love to accessorize - glittery bunny necklaces, brightly-hued, locally made headbands, super-fly kid-sized shades, woven butterfly bracelets, ice cream flavored lip gloss...you get the idea. We have creepy crawly bugs that hop, little jars of stretchy lizards and dinosaur bones, butterflies that flutter and twirl, and real, working microscopes for examining the above specimens. The Easter Bunny especially loved our stash of temporary tattoos (and was slightly peeved that they don't stick to fur).